Voted the best European production yacht under 10 metres in Dusseldorf earlier this year, the new Rob Humphreys-designed Elan 340 comes with high expectations. Steve Raea set sail on the first of the new design to arrive down under. Ten years ago Elan was almost singularly known as a manufacturer of quality skis. Based in Slovenia, the company has undergone an aggressive expansion program and enjoyed rapid success as a production yacht builder. This is in no small way attributable to the design input of Britain’s Rob Humphreys. Humphreys original commission for the Elan 333, the company’s successful entry-level performance cruiser, effectively launched the Elan brand onto the yachting stage and created a new era of yacht production. Subsequent investment in plant and tooling has seen bigger Elan models follow, including the highly successful Impression range of offshore cruisers. Performance, however, has always been a company cornerstone and Elan has continued to steer its designs towards the performance end of the market. It is appropriate, therefore, that the successor to the Elan 333 delivers on that promise. With more than 500 333s sold, Elan was mindful that its new 340 should retain the same qualities that so obviously appealed to the European yachting market. These essentially boiled down to good performance, ease of handling and a comfortable cruising-orientated interior that served weekend cruisers and charter operators alike. The new Elan 340 is a different beast with a more purposeful look and feel but it shares similar design ergonomics to the 333. Whether the new 340 meets the complete design criteria remains to be seen because, as a cruiser, it falls a bit short in a few areas. But, as a one-design performance-orientated yacht, Humphreys and Elan have hit the nail squarely on the head. The new 340 has a finer entry and a fuller afterbody than the original 333 and this has increased the yacht’s form stability and improved downwind speed. Waterline length has been maximised at 9.39m which, together with an optional deep draft keel (2.10m), carbon rig and mast-head/fractional sail plan, there is no disguising Humphreys’ design emphasis. But with an estimated displacement of 5000kg (ballast 1490kg) the new 340 does not fall into the category of light-displacement racer. Like all Elan yachts, the 340 is built to Germanisher Lloyd certification and this demands a minimum standard of structural engineering. The heart of Elan’s structural integrity comes from an inner grid of transverse and longitudinal GRP frames and stringers that form the floors. This grid is glued and glassed into the hull to provide a stiff but reasonably light hull structure. The hull itself is laid-up with quad and multi-axial GRP with Kevlar strengthening around the mast base and bow area. Vinylester resins are used in the outer lay-up to resist osmosis. Curing is vacuum-assisted to maintain correct resin levels without unnecessary weight. Gel coats are now roboticly sprayed to ensure an even thickness and uniformity throughout the hull. Like most production yacht builders, Elan relies on CNC cutters to cut all internal timber joinery. This is pre-assembled and fitted into the finished hull. The hull to deck join is both glued and mechanically fastened with stainless steel bolts for improved shear. The hull and deck are also laminated to form a single unit at the bow and stern. The cast iron lead-ballasted keel is attached with 10 stainless steel bolts with a heavy-gauge stainless steel liner fitted to the internal grid. Chainplates are similarly fastened with stainless steel rods bolted directly to metal plates positioned within the grid liner. Mindful that this is Elan’s entry-level yacht, the internal fitout is fairly basic but nicely finished with a one-piece internal deck liner, light timber veneers over ply, recessed downlighting and a dark ply sole epoxy-sealed and finished with a hard wearing plastic laminate. All skin fittings are of bronze, double-fastened and easily accessible. The Volvo D130 29hp diesel engine is mounted under the companionway stairs with engine access panels port and starboard. Sleek and purposeful, Elan has endeavoured to create a seamless, clutter free deck layout with recessed hatches, hand rails and a one-piece cabintop liner to cover and protect halyards and reefing lines running aft from the mast. The idea is excellent and works well but it creates problems should it be necessary to change or re-thread a halyard. The liner covers the entire coachroof and is too large and bulky to remove safely at sea. It also requires removing the dodger. Two smaller removable panels would be more manageable. Elan importer Mike MacPherson agrees and says he has had discussions with the builders. Other than that, the 340 is an easy boat to work with sheeting tracks positioned inboard of the shroud base giving wide uncluttered decks and easy access to the foredeck for sail changes and spinnaker work. Elan’s split bowrail makes light work of setting and retrieving the anchor and stowing within the anchor locker. This is located at the extreme bow and is very deep. The moulded locker lid allows it to close over the shank of the anchor when cruising. Factory-fitted with a Lofrans 1000-watt windlass with up and down switch pads, anchoring should be no fuss. In standard trim the Elan 340 carries a 7/8th fractionally-rigged twin spreader Selden anodised aluminium keel-stepped mast and is secured to common chainplates with single lowers and caps and the choice of Furlex 200s furler or a Tuff Luff groove for racing. The yacht has been designed to carry both a fractional or mast head spinnaker. MacPherson elected to have the yacht’s sails made by North Sails’ Auckland loft rather than buying sails directly from the factory. He says there is very little difference in price. Elan is well regarded for its cockpit designs. A lot of thought has gone into the new 340 to create a layout that suits both racing and cruising. Most notable among changes over the 333 is the positioning of the wheel at the extreme rear of the cockpit. This provides plenty of room for the mainsheet and headsail trimmers but does tend to constrict the helmsman when standing behind the wheel. This is mitigated by removing the clip-in transom board. Elan has not skimped on deck gear with quality Harken primary and secondary winches and blocks. The powder coated A-frame pedestal and large twin-spoke stainless wheel is from Jefa of Denmark and this is well engineered, giving easy access to the quadrant, blocks and quadrant wire. The steering is positive and extremely light, but more on this later. For weather work, the helmsman has well placed foot braces and a wide comfortable seat on the recessed box combing. The mainsheet traveller is positioned immediately forward of the pedestal and well aft of the primary winches. Cockpit storage is excellent with recessed wet lockers port and starboard of the wheel and a central locker housing the cockpit drains, quadrant and small gas bottle. The port and starboard lockers are fitted with removable bins but these take in water because of their location in the sole. Drains would rectify this. With optional teak covering and solid stainless steel catches and hinges, Elan has not skimped in this area. A further two cockpit lockers are built into the cockpit seats forward of the mainsheet. The starboard of these is cavernous but deep and would benefit from nets or shelving to prevent crew physically having to climb in to retrieve equipment at sole level. The port side locker is shallower but still large enough for spare sheets, fenders and other frequently used equipment. Running rigging is traditionally laid out with all halyards, reefing lines, vang and outhaul running aft through Spinlock XAS clutches mounted on the cabintop. The test yacht was fitted with a single back stay with a 3:1 tensioner via Harken blocks and clam cleats. Backstay tension can be adjusted by the helmsman from both port and starboard. New to the 340 is an arrangement whereby the companionway hatches drop down to the cockpit sole rather than having to be removed and stowed. It is a genius arrangement whereby the bridgedeck is effectively a hinged box. This provides the ideal place to put halyard tails. The companionway slides and hatches are acrylic. The only possible question mark over this arrangement is the physical strength of the double slides which appear only to be screwed to the super structure. The companionway entrance is quite narrow but should pose no real difficulty for all but the largest crew. Remembering that the Elan 340 measures less than 10m overall, Humphreys has done a masterful job of packing in as much volume as possible. The immediate impression is one of space but, as with other production yachts, there are trade-offs that are not immediately noticeable. The 340 is available with just the one layout – a double cabin port aft, head/shower starboard aft and a double cabin forward. The galley is set to port with a half-size chart table opposite and a central U-shaped settee, bi-fold table and settee/berth opposite. The bathroom/head is large and practical with a moulded twin sink unit running fore and aft with stowage above and below. The head faces forward and behind is a decent wet weather locker that drains to the bilge. Standing headroom is reasonable but those drawing more than about 5’5″ will have to stoop getting through the door. The galley is not large but well equipped with a two burner oven and hob on gimbals (no rear fiddle on stove top), twin stainless steel sinks, single hot and cold mixer, manual sea water pump to galley and a large 12-volt Isotherm benchtop fridge/freezer unit. Galley stowage is a bit marginal given that the boat’s pumps are fitted in the cupboards under the sink and stove. There is a small set of drawers beside the stove and two sliding lockers above but that is about it. The central saloon is open and inviting with a large bi-fold table, overhead deck hatch, cream-coloured textured squabs and excellent down lighting. The forward or master cabin is the pick of berths. This provides the option of two single berths or a double (with the addition of a small infill squab.) The cabin has his and her lockers port and starboard, good lighting and an overhead deck hatch. There is good storage under the squabs which can be accessed via a door in the bunk front or through the locker lids on top. Both cabins have secure doors for privacy. So, after all of that, how does the boat sail? There is no doubting that the Elan 340 is fast for her size. With good sails (North’s 3DL No 1 and dacron main), the Elan managed 6.5 knots to weather in 10 knots of wind (true) on a flat Waitemata Harbour. With sheets cracked, the 340 increased her speed to 7.5 knots in 11 knots (true). The helm is remarkably responsive and light, even when pressed under a shy gennaker. Crew for the short test sail included experienced Young 88 sailor Roger Land. Land noted that the yacht tacked through as fast if not faster than a well-crewed Young 88 and pointed extremely well. The wind did not exceed 12 knots but this was enough to get the yacht sailing efficiently. 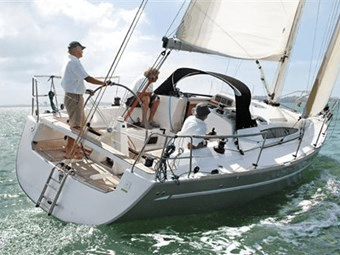 With what could be described as a lofty rig, the Elan will benefit from crew weight on the windward rail and should carry full sail up to about 18 knots true. While yet to race competitively, the Elan 340 is expected to rate favourably under the IRC handicap formula which is dominating in Europe and gaining momentum here. The yacht will make an excellent club racer while being fully capable of tackling longer offshore events. Her biggest class competition is likely to come from Beneteau’s new Farr-designed 34.7 First and Dufour’s performance 34. MacPherson has rigged and equipped the 340 to race and plans to campaign the boat in Auckland over the coming months. Yacht supplied by NZ Yacht Brokerage Ltd, Westhaven, Auckland.